Holiday Practice is a fun game of multiplication practice. 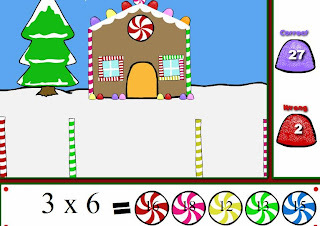 For each multiplication question you answer correctly, your gingerbread house gets a new decoration. There are three levels of multiplication to practice: 0-3, 0-6, or 0-9. At the end of the game, if you've done well, you get to decorate your very own gingerbread house. What a fun way to practice multiplication facts during the holiday season! 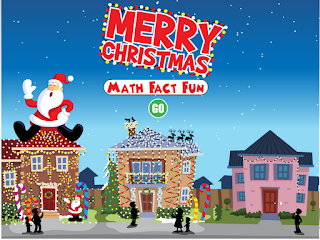 Christmas Lights: Math Fact Fun is a a fun fact game that allows students to put up Christmas lights after practicing math facts (addition, subtraction, multiplication, or division facts) for one minute. Students will want to work quickly because the more math problems you solve correctly, the more lights you will be given to decorate your house! Christmas Lights: This game is the same as the Christmas Lights: Math Fun Facts game but without the math facts. A great and fun game for younger students who need to practice their mouse skills! The lights in both games are animated and look beautiful with the overhead lights turned off. Both of these games would be wonderful to use as a whole class on your Smart Board or individually with students at their own computers. The Christmas Tree Puzzle is a fabulous online site for problem solving and critical thinking. The goal is to light up the Christmas tree by connecting all the wires to the light source. It's lots of fun but it is definitely a challenge that requires lots of problem solving. 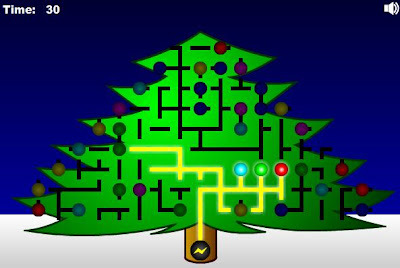 The Christmas Tree Maze is another fun tree puzzle. To complete this task, you must drag the bar of lights at the bottom of the tree along the maze of white wires until one of the end bulbs lights up the star at the top. Any move is legal, as long as all three bulbs stay in contact with the white wires at all times. Santa's Sleigh is a fun and challenging game. The object is to put sleighs so that each Santa has one sleigh & each sleigh only belongs to one Santa. It's fun & much harder than it sounds! Snoring to Winter is a fun game from ABCya. Christmas Chain is a fun racing game! Santa's Village has a new game to play every day! 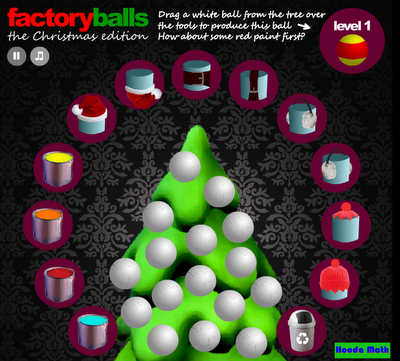 Factory Balls- Christmas Edition is a fun site where you try to create the patterns and colors of the ball on the tree! It sounds much easier than it is! sugar starts to pour. Get sugar to the cups. Civiballs Christmas Pack is a another fun game. Click to cut a chain and release a ball. Move all colored balls to their matching goals. 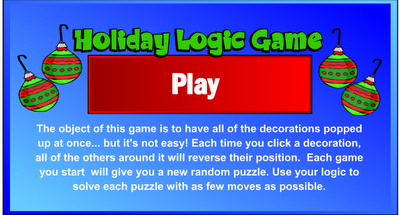 Christmas Memory is a game is a basic concentration game with a twist. If you aren't fast enough, the rows move and you are timed. It has levels that range from EASY to VERY HARD. On the site Santa Claus's Trip, students view a map of the world, are shown the route that Santa will take to deliver toys, and then they have to touch the countries to recreate his route. When the correct country is touched students even magically travel to that country to see the gifts delivered. What a great way to review the world map and have fun all at the same time!